Add all ingredients to large pot & bring to boil. After 15 min, remove chicken and shred (two forks to pull apart). 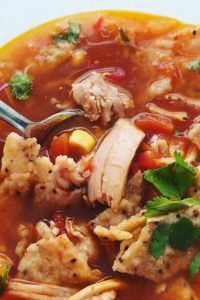 Return shredded chicken to pot and simmer for 45 min. Serve topped w tortilla chips & garnish w cilantro.